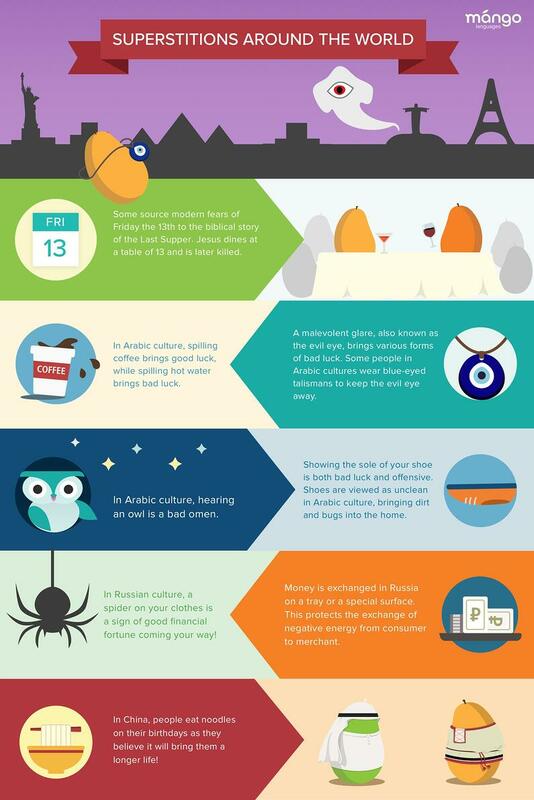 Friday the 13th & superstitions around the world. If you’re anything like us, you cleared your calendar today. This year’s second Friday the 13th is finally here, and we’re ready for it. We believe that knowledge is power, and the best way to equip yourself against the spooky superstitions that keep us up at night is to educate yourself on Friday the 13th and other superstitions around the world. From avoiding contact with butterflies in Korea to Italy’s unlucky Friday the 17th, there are plenty of fascinating superstitions around the globe to keep your mind occupied all day long. Since you’ll have a clear calendar today (who works on the unluckiest day of the year!? ), why not take our Russian Superstitions and Arabic MSA Superstitions specialty courses for a spin? These quick, easy, and super interesting mini courses take you through some of the most notorious and interesting superstitions in Russian and Arabic cultures. While all of your friends are shaking in their boots today, you’ll be reading up on the Evil Eye and the curse of empty buckets in Russia. Start learning now and you’ll be armed and ready to ward off bad luck all day long!